We think of myths as commonly-held ideas or beliefs that are in fact not true. We even watch as Myth-busters test out and disprove popular myths. Why then would myths be the key to saving the world? Before myths were false, they were traditional stories that explained the world and our place in it in some way. Often, myths employ supernatural beings, heroes and powers. Many religions hold people to the faith and spur them to action through the power of their stories. What if we could use such powerful stories to motivate continuous improvement? 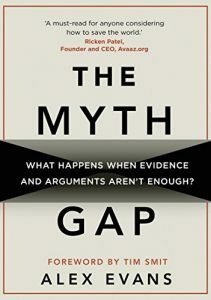 The book The Myth Gap: what happens when evidence and arguments aren’t enough? addresses this question in the context of the major social and ecological issues of the day. This concise book does a a great job of showing how people are motivated by stories that resonate emotionally and inspire them, rather than by experts droning on about facts and flipping through charts. Recent populist votes in countries such as the UK, USA, the Philippines and parts of Europe appear to demonstrate the power of emotional resonance, if not myth, over expertise and facts. 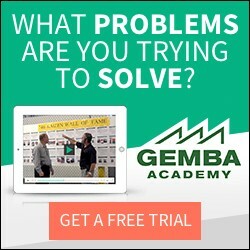 This topics is very relevant for any of us who care about solving problems collaboratively, and by extension about practicing the ongoing learning and behavior change exercise that is lean management. How do leaders typically try to get people on board for lean transformations? They point out that the smartest experts say we should be lean. They may present charts of peer companies, leading local firms, customers and competitors who are doing it. No doubt there will be data showing that the potential savings and the cost of not adopting lean practices, are great. More often than not there is an appeal to emotion, a hint of threat to those who will not engage and the possibility of reward for those who do. Which of these methods are most effective? How often do we use compelling “myths”, origin stories, and modern day tales of monsters and heroes to bring people together for a cause? Aristotle’s modes of persuasion are all in effect, but The Myth Gap seems to argue that pathos, or an appeal to emotion, is the most powerful and yet the least positively utilized. The other two modes, logos, an appeal to logic, is often the first resort. Ethos is an appeal to ethics or credibility of the person doing the persuasion. These latter two are necessary but not sufficient. Lately, it appears they may not even be necessary if the appeal to pathos is strong enough. In a way this is not surprising at all. Logos, persuasion appealing to logic, demands the most from us neurologically. We need to grasp the meaning of words and images in the charts, make information out of data, resolve any cognitive dissonance, and integrate it into our way of thinking. These things require energy and effort. Appeals to credibility, or ethos, may require thought but less mental energy than logos since it is largely a personal social judgment. Pathos, or appeals to emotion, hit us in the amygdala and other parts of the limbic system. Compared to logical or ethical judgments, it takes relatively little effort an energy from our brains to be triggered to fear, anger, joy. 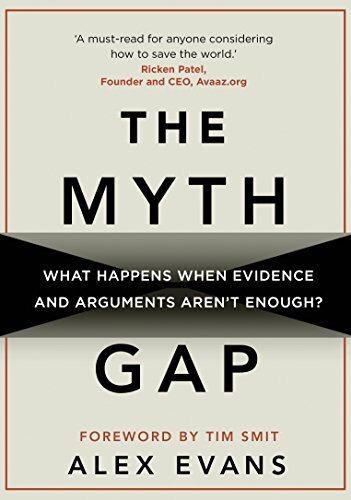 The Myth Gap reminds us that when it comes to motivating significant change, what matters is not who you are or what you say, it is how you make people feel.